Is your Energy Bills Eating into your profits? Save pumping Cost upto 20 % with Us. Pumping system accounts for an estimated 40% of the electricity used in the industrial sector in India, or almost 15% of the total national electricity consumption. Studies have shown that over 20% of the energy consumed by pumping systems could be saved through changes to equipment and/or control systems. 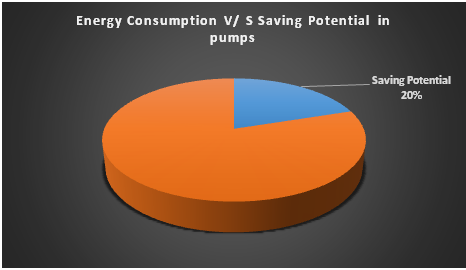 Energy efficient pumping systems do not cause any unnecessary strain on the system and can also be considered as 'optimally performing pumps.' Otherwise stated, the most effective pump systems are the ones best suited to the specific environment to achieve optimum performance. The reduction of excess energy use can mean hundreds of thousands of Rupees in savings to a company's operational costs over the course of time. Depending on the extremity of the energy savings, this can mean a large amount that can be placed elsewhere in the business either over the course of a shorter, or a longer period of time. Best customize solution for pumping system after conducting Energy Audit.